The dynamic element of shifting competition and cooperation with fast gameplay makes this game unique. Please be aware this game might not be suitable for all gamers. The game contains graphic and gory images from The Walking Dead TV series on AMC. This 1-4 player game that runs in less than hour is based on the hit AMC series The Walking Dead. The show’s events and characters are woven into a challenging gaming experience. Having read the comic book series and watched the tv show makes it easier to be immersed in the game’s story elements. However, no prior knowledge of the series is necessary to play the game. Cryptozoic’s The Walking Dead Board Game appeals to a larger audience. It’s light mechanics and connection to a mega popular tv series make it the kind of game that will bring new gamers to table. The game remains true to form in that the zombies usually win. Like the television show the characters are in a dire situation with very few resources. They will have to decide how much assistance to give to the other players. But beware! This zombie game has a unique game mechanic. Those who don’t survive the zombie onslaught can come back as undead and hunt survivors down. Players select a character and start off in the center of the board called Camp. Each player starts off with 2 Ally Tokens, a.k.a. zombie meat shields. If you’re overcome by zombies Allies can take the hit instead. Starting from camp, players will roll a die and try to get their character to each of the four corners of the board, where they will collect a special location tile. Each tile will give the player a bonus ability. Along the way they will have to draw from an encounter deck and find resources, like weapons, called Scrounge Cards. When facing off with a zombie or other challenges, success is determined by a die roll. Players can modify the outcome by adding Scrounge Cards to the fight. When players lose a zombie attack the game is not over for them. They come back to torment the remaining survivors as a Walker – pay back time! The goal of the zombie players is to attack until there are no survivors. As a non-zombie player the goal is to successfully collect all 4 location tiles and make it back to Camp. Wait, a role-and-move game? That can’t be good. Yes, it is a game where a die is rolled to move your pawn. However, the path is not linear and you choose to go forward or backwards along the different paths. Is this just a race to the four corners and back again? Seeing opponents attacked by zombies keeps it interesting and there are choices to be made along the way. Choices such as, should I keep my teammates alive or let them be turned into Walkers? Letting other players turn to Walkers early on is really chancy. With Walkers in play the chances of survival goes down quick. Because this Walking Dead* game is based off the television show it benefits from the stunning imagery taken directly from the show. The award winning special effects zombie makeup featured on the components is striking. One of the unique components is the game board made from playmat material. Opinions are really divided whether the rubberized material is an innovation or digression. On the downside the mat maintains that odd rubbery smell common to all playmats. It is virtually indesctructable. It wont warp or peel apart like some games with boards do. The die doesn’t fly off the table, it plops nicely onto the rubbery mat. The only downside is that the mat is stored in the box rolled up, so one edge tends to lift a bit off the table when you first lay it out. *There is another Walking Dead Game based off the comic book made by Z-man Games. Bearing in mind that this game is based off a really gritty brand, we wouldn’t recommend this game for families with young children, but older teens might enjoy this game. The game doesn’t accommodate a large number of players. But if you want to get social with a small group then go for it. Social Gamers will appreciate the quick game play and ability to interact with other players. This game has simple mechanics and a lot of luck. The Walking Dead Board Game is easy to learn and isn’t too drawn out. Casual Gamers will walk away with a fun zombie-game experience, that isn’t over burdened with rules. Avid gamers who aren’t opposed to a roll-and-move mechanic should try this game with their non-gamer friends. It’s really hard to win as a survivor and avid gamers will appreciate the unique challenge of cooperation and competition. Keep in mind it’s best to play this game with a sense of humor. Power Gamers may feel frustrated by the lack of control when dice rolls and random cards don’t go their way. When playing in competitive mode, coming back to the game as an undead Walker is awesome and makes for some good laughs. An often overlooked mechanic is the subtle shifting of allegiances as players turn into zombies. It’s best to play this game with a sense of humor, laughing at the misfortunes of your opponents as they struggle to survive. This is not a deep strategy eurogame where you’re always in control. There is a fair amount of luck and the encounter deck could feel repetitive for some. As the box suggests this game uses visual elements of the tv show, which is loosely connected comic book story. Should you fall to the hungry horde of walkers, the game doesn't end. When a player dies and becomes a walker, they leave the world of the living behind and seek out the remaining survivors. Spring surprise attacks on the living, cause the walkers to frenzy, or contaminate the survivor’s supplies. Put the bite on your former friends and they’ll join you in your pursuit of the living. As a survivor, you'll work as a team with your remaining buddy to ensure the camp site stays protected. Share weapons and other resources. The fate of the human race is in your hands, either as a survivor or a walker. Test your surival skills and fight to live another day with The Walking Dead Board Game from Cryptozoic Entertainment. Cory Jones shows what's inside the box. Based on the hit AMC TV series. Learn how play The Walking Dead Board Game based on the hit AMC TV series. The game is rather simple. Not many rules to learn, not many cards to become familiar with, but still requires some level of attention to play well. The $40 I payed for this game were not worth it–There just isn’t that much value in it for me. If you really want the game, I suggest making sure you get a lower price. The board–a roll-up mat, is obviously lower quality than most game boards. The cards also don’t feel quite as nice as what I am used to. The figures are flat cardboard tokens rather than the miniatures that most games have. The only things that are really up to par are the ally tokens, the character cards, and the box. With so few different items, and so few different enemies, and always the exact same goal, this game gets really old really fast. There simply isn’t enough variety to allow for different strategies. Being able to choose which direction you move–rather than just going around in a circle–is nice. But that’s the most choice you’ll get. Roll the die. Draw an encounter. Play some cards. Roll the die. Repeat. A good social game will bring conversation to the surface. People will laugh and talk about things that are happening in the game. This doesn’t have that. The lack of player interaction drops this even lower. For a game based off a TV show, this is quite disappointing. Rolling the same die over and over just doesn’t make me feel like I’m in the middle of the apocalypse. The limited scrounge cards are a nice touch–never enough to go around–but it’s not enough. The rulebook is probably the best part. Simple game makes for simple rules, and there isn’t much confusion. It is difficult not to balance a game with so little complexity. Still, there are a few characters I would pick every time over others, and drawing the wrong encounter at the wrong time will kill you, rather than hurt you but still give you a chance to catch up again. It was kind of fun to pull out the first time and play though a few games, but even in the middle of the first game it got a little bit repetitive. I don’t like this game. I don’t. I would not suggest this game to anyone. It’s not worth it. Components: Fans of the TV series will enjoy the full color cards featuring photos of show characters, etc. The “board” is actually more akin to a giant mousepad, spongy and not really appealing. Gameplay: Gameplay is fairly simple, consisting of moving around the “board” to capture different locations while trying to stay alive. You roll a die, and must move exactly that many squares. Your landing square imposes a condition. Conflicts (i.e., zombie attacks) are resolved by rolling one or more six-sided dice. Scrounge cards can add to your rolls, and allies can help protect you. It’s a game of attrition, and it has a very random feel. Maybe you’ll pull the right card, and maybe you’ll roll the right number … and maybe you’ll stop caring after a while. Bottom line: For completists and huge TV show fans, this game might be appealing. But the weird, poor-resolution board and simplistic gameplay make this game a “pass by” for most boardgamers. If you’re looking for a decent zombie game that isn’t too complex, try Last Night on Earth or Zombicide instead. If blasting zombie brains is your thing and learning complex rules is not – this game is definitely for you! Based around the premise of the gritty AMC series, this game for 1-4 players starts off cooperative but may turn competitive as players turn to zombies and start hunting their former allies for their delicious brains. A board consists of a series of spots, some having special effects like easier combat or no threat of zombie attack. Players roll and move in an attempt to visit all four corners of the board. After each move a player resoles an encounter (which most of the time is a zombie fight). Combat is resolved with a simple die roll, that players can enhance by playing cards from their hand. If the player loses – zombies munched on one of your non-player character allies. If you didn’t have any allies – you’re dead. It’s quite a simple premise that really does not present much of a game system – a very basic roll and go, followed by a “roll as high as you can” combat – greatly luck-based and not permitting for much strategy. However, somehow all together it is not terrible. It doesn’t quite reach for gaming greatness, but the gameplay is fast and fun, the sense of danger ever-present and the feeling of overwhelming odds and time running out is true to what you’d expect of a zombie survival story. The switch to a role of zombie brings a nice twist to the game, introducing some variety. The bonuses received from visiting the corners and the order in which you go for them add a little depth (do you grab a car first so that you can go farther or visit a police station to get some extra guns?). Best of all the game is tough and presents a real challenge (mind you, overcome mostly by rolling really well as opposed to brilliant tactics). This results in a solid challenge that introduces some replayability, although experienced gamers are sure to grow tired of this one pretty soon. It’s a good game to ease those new to the hobby into the fold and might be perfect as a gateway game for teenagers. Don’t expect much and get into the zombie mood and you’ll have a good time with this. Quick to play even for a newby gamer,the rules are so simple and may be you gone to take less tan a half hour to get the general idea of the game, regardless of this I have to say something negative about the lucky factor because is to strong and this could cause a frustration on power gamers. In a positive thought this game could give you the chance to involve a new gamers due to the simplicity of the mechanics and the few components. With an extremely simple mechanics is great for beginners and attract players with little experience in board games. Though the rules putting that only one player can win the game that rarely happens. Acting group is the key to the game. Whenever possible try to help the classmate next to you, because you never know when he will be able to turn a zombie and attack you in the next round. Quite common to have happen and the team of zombie survivors. If the group is selfish way, certainly the zombie team will win the game. Playing fast and great to play with people on a late Sunday afternoon when tired and without much will to think (and of course, playing something akin to relax and pass the time). Se você já jogou o velho e bom jogo de Ludo e quer fazer uma nostalgia “macabra” deste jogo, a opção é jogar “The Walking Dead Board Game”. Com uma mecânica extremamente simples é ótimo para atrair jogadores novatos e com pouca experiência em board games. Apesar das regras colocarem que pode 1 só player vencer o jogo isso raramente acontece. Agir em grupo é a chave do jogo. Sempre que possível tente ajudar o coleguinha ao seu lado, pois nunca se sabe quando ele irá poder virar um zumbi e te atacar na próxima rodada. Bastante comum acontecer de ter o time zumbi e o de sobreviventes. Se o grupo for meio egoísta, certamente o time zumbi irá vencer o jogo. Jogo rápido e ótimo para brincar com as pessoas num final de tarde domingo quando se está cansado e sem muita vontade de pensar (e claro, afim de jogar algo para descontrair e passar o tempo). 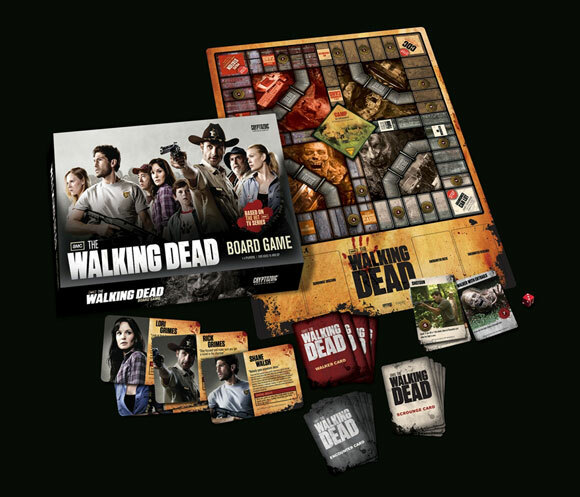 Based on the television series, The Walking Dead Board Game is a light, fraught game in which the Survivors must visit four important Locations and return to Camp while fending off Walkers (as the zombies are called) and scrounging for guns and tools to aid their survival. Each Survivor must be resourceful, carefully husbanding his guns, his baseball bats, and his Allies if he is to succeed. Loose too many Allies and a Survivor is vulnerable to the flesh-rending teeth of the Walkers. When that happens, the Survivor is not only dead, but rises as a Walker himself to hunt down the remaining Survivors! Initially won by the first Survivor to visit all four Locations and return to Camp, when two Survivors get turned into Walkers, the players split into two teams – Team Survivor and Team Zombie (why Team Zombie, ‘zombie’ not being a term used in The Walking Dead? ), and the game becomes co-operative. If Team Zombie kills the remaining Survivors, it wins; if a single Survivor manages to visit all four Locations and return to Camp, Team Survivor wins, even if only one Survivor remains! All of the components are nicely done in full colour and illustrated with stills from the television series. Notably, the board is actually a cloth. It has the Camp at the centre and a Location at each corner – a Police Station, the Center for Disease Control, an Abandoned Car Lot, and a Department Store. A track connects them all, with sewers, useable only by the Walkers, connecting each side. Scrounge Cards represent items and events helpful to Survivors; Encounter Cards represent Walkers and Events that will beset Survivors; and the Walker Cards are used by Walker players whose Survivors were killed. Location Cards are awarded to Survivors who visit each place and the Badges indicate each player’s side (Team Survivor or Team Zombie). At game’s start, each player selects a character card, either Rick, Lori, Shane, Glenn, Andrea, or Dale. Each Survivor has a single ability that he can use once per game. For example, Rick can re-roll an attack with a +2 bonus. Each Survivor also receives five Scrounge Cards and two Ally tokens. The Scrounge Deck is filled with ten cards per Survivor. When it is exhausted, the only source of Scrounge Cards is the discard pile and the cards in each Survivors’ hands. On his turn, a Survivor rolls the die and moves in any direction. Typically where he lands will lead to an Encounter Card being drawn. Others give him a bonus to the Encounter, another turn, a Scrounge Card, or No Encounter. Most Encounter Cards force a Survivor to fight a Walker, but others give him or force him to discard Scrounge Cards due to personality conflicts (in keeping with the television series). To fight a Walker on an Encounter Card, the Survivor rolls the die and expends Scrounge Cards, mostly weapons to add a bonus to this, to beat the Strength of the Encounter Card. Walker Strength on the Encounter Cards varies between five and ten, with Scrounge Cards giving a bonus of between one and six. A roll of a six always wins, but if a Survivor loses, an Ally is lost, or if he has no Allies, then he is bitten and will rise as a Walker on his next turn. Winning an Encounter allows a Survivor to take a Scrounge Card, if there are any left. As soon as a Survivor reaches a Location, he stops and draws not one, but two Encounter Cards, which he has to deal with in order. If the Survivor deals with both, he receives the appropriate Location Card. This gives him a permanent bonus. The Police Station gives an attack bonus, the Abandoned Car Lot a movement bonus, the Department Store an extra Ally if you visit it first, and the Center for Disease Control more Scrounge Cards, either two new ones, or one from the bottom of the discard pile – the latter is useful if you know what that card is and useful later in the game when the Scrounge Cards have been all taken. Should a Survivor die and rise as a Walker he receives all new Walker Cards. To win he must kill the remaining Survivors. The Walker Cards allow a Walker player to increase his movement, replace an Encounter card drawn by a Survivor with a Walker Card that the Survivor must fight, cause a Frenzy and increase the Strength of a Walker on an Encounter Card, and worse, cause an Ally to be ‘Bitten!’ and be discarded. If the Survivor manages to beat a Walker Card played on him, then not only does he beat the Walker Card, but also the Walker player as well! Unfortunately, you cannot keep a good Walker down and he will rise again in the nearby sewers. Additional rules allow for solo player, but the main alternative is a four-player Team Game. This has the game start with the players divided into two – Team Zombie versus Team Survivor, just as if two Survivors had died in the standard game. The Survivors only need to get to the four Locations between them and only one of them needs to make it back to Camp to win. Best with four players, The Walking Dead Board Game is better than you think. It is hard for the Survivors to win and everything they do is challenging as they must carefully husband their Scrounge Cards before they all run out. It is not a challenge to learn and play and it involves more luck than skill, making the game suitable for play by fans of the television series who are not seasoned gamers. The latter are unlikely to really enjoy the game because of the lack of challenge for them and the degree of luck. That said it captures the desperation of the television series, more so if the players know the series and play to the characters on their card. Add a Review for "The Walking Dead Board Game"